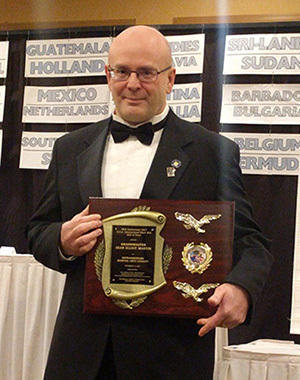 Sean Elliot Martin, Ph.D., full-time instructor and director of online programs for the Department of Criminal Justice and Intelligence Studies, and coordinator of the undergraduate intelligence and national security program at Point Park University, was honored at the Eastern USA International Martial Arts Association Black Belt Hall of Fame. The annual event features martial artists from more than 70 countries. Martin founded the martial art Kage-Essensu in 2003 and has been teaching it at Point Park for the past 14 years. He also teaches a Kage-Essensu workshop every year at the Black Belt Hall of Fame for grandmasters and masters from around the world. "Kage-Essensu was officially recognized by the Eastern USA International Martial Arts Association after a long review of documentation of my techniques, philosophies, students, and applications. This is a very efficient, practical martial art that was developed primarily for life-and-death situations, as well as for use by the intelligence community and law enforcement," Martin explained. "While the subjects we address are very serious, the atmosphere of the classes is pretty relaxed and fun," he added. "Professor Martin is an amazing teacher and I was interested in learning more martial arts and the individuals honored," said Noelle Wachter, a freshman criminal justice major from Bethel Park High School who attended the Black Belt Hall of Fame event with Martin. Wachter added: "I plan to work in law enforcement, and Point Park has the best program for me to achieve my career goals."